Acorn Woodpecker observed and photographed at Cave Creek in the Chiricahua Mts., Cochise Co., Arizona, USA. The image is copyrighted by Robert Shantz. Acorn Woodpeckers in Arizona's sycamore woodlands are noisy and conspicuous birds that are especially common where there are plenty of oaks. The white, black and red pattern is distinctive. When acorns are available they are often in great abundance. In order to use this food resource over and extended period Acorn Woodpeckers construct granaries in tall dead trunks of sycamore or cottonwood trees. These appear as holes drilled into the wood to a diameter that tightly holds acorns that are pushed into them. Each hole may hold a few acorns and the holes are constructed in a group of many dozens to hundreds or even thousands of holes! Such a store needs to be guarded from robbers (like jays) and this is where Acorn Woodpecker's social grouping is so usefull. When the woodpeckers must leave the area for water or other foraging at least one remains behind to watch over the harvest. 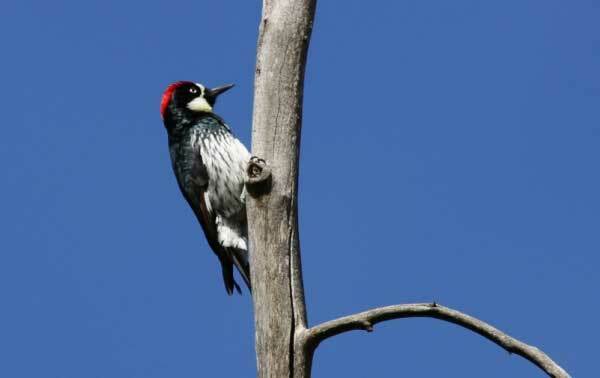 In summer acorn woodpeckers take up flycatching, catching insects on-the-wing, to feed their young. Fat, alate (winged) ants and termites are a vital resource during breeding.